I have concluded my travels for the year, and my 2018 travel/teaching schedule doesn’t begin until March of 2018. I have all kinds of ideas to weave up and things I want to do … but first, as promised, I am having another kit sale. It will be short – starts today, November 8, and ends on November 17. Many of the kits I have on sale, I will no longer be making and some kits I only have 2 or three left. When they’re gone, they are gone!! Shipping, same deal as before: $5 for one (1) kit, 7.50 for two (2) kits, $10 for three (3) kits, 12.50 for four (4) kits and $15 for five (5) or more kits. An experiment in 5/5 twill; careful placement of stakes and weavers brings out the arrow design. 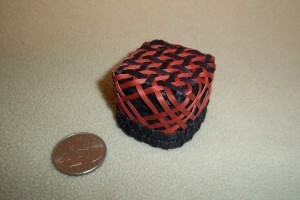 The rim is overlayed and double lashed with waxed linen. 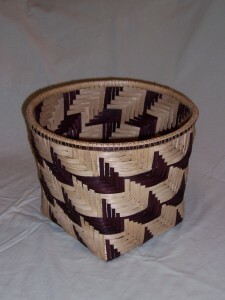 Finished Size of Basket: 12″ diameter x 10″ high.